Problems with static electricity in the plastics industries are numerous. Processes where static charge can be an issue include injection moulding, blow moulding, thermoforming, rotational moulding, parts conveying and collection and assembly processes. The attraction of airborne contaminates as a result of static charge on a substrate is becoming more and more of an issue as the quality standards of companies continue to be raised. Dust and particlulates attracted by the static charge on the part can result in high and expensive scrap rates. This is especially the case if the material is to be used in the medical or food packaging industries, or in the painting of automotive or white goods. A recent stipulation of food packaging companies is also that static control equipment cannot use air to assist long range ionisation, for fear of blowing additional contaminants on to the products to be neutralised. This is becoming increasingly significant as companies strive to improve health and safety standards. Operator shocks are typically the result of an accumulated charge or “battery effect” occurring during the collection of parts in a bin or assembly area. The use of a long range Pulsed DC system delivers widespread ionisation without the requirement for an air delivery system. This is ideal for very thin gauge parisons which are prone to being prematurely cooled or misdirected by the slightest of airflows. Large mouldings such as rubbish bins, plastic lawn furniture, toys, plastic pallets and containers can develop very large static charges. When the tool is removed from the part, the static charge can cause severe operator shocks and can attract dust from long distances. The normal solution is the installation of a ionising blower of sufficient size to neutralise the charge on the part as the tool is taken away. A ionising air curtain or ionising gun are alternative solutions. 1. The unwinding of the material causes dust attraction which is later impregnated into the thermoform. 2. As the forms exit the tool, the static charge can cause additional dust attraction or stacking problems. 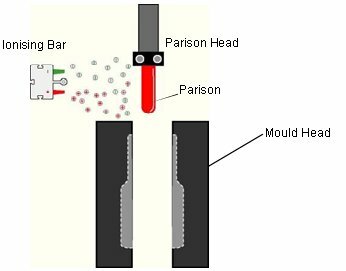 Installing a ionising blower or long range Pulsed DC bar in Position [A] will prevent dust attraction. 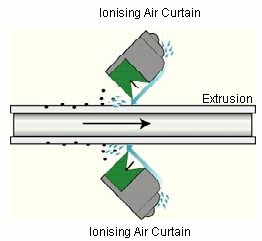 A ionising air curtain at Position [B] will ensure that the film is clean before entering the machine. A long range Pulsed DC bar or blower at Position [C] will neutralise the forms so that they will stack evenly. 1. Dust attraction on to parts on the conveyor and in the collection bin. 2. Severe shocks to personnel as a result of a “battery effect” in the collection bin. 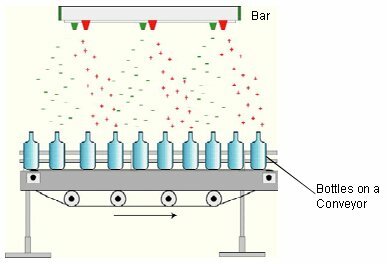 A Pulsed DC bar mounted over the bottle line will create a constant flow of ions to neutralise the moulded parts, the conveyor and the operators’ bodies via their hands and arms, which are regularly placed within the ionisation field. 3. Misbehaviour of very small parts so that they will not assemble properly. 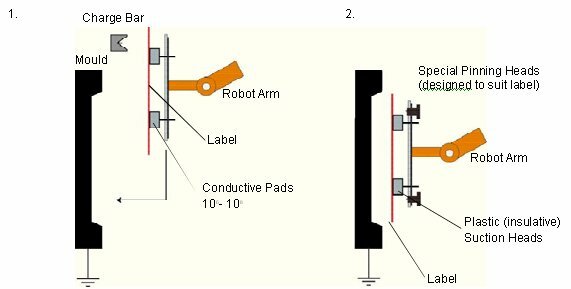 Installation of a long range 976 Pulsed DC bar over the workbench or conveyor will alleviate the problem. The bar is typically mounted overhead, out of the way of the operator, and neutralises the charge on the part as well as the operator without the use of air. 1. Opposite charged materials will cause “clumping” and not allow proper feeding. 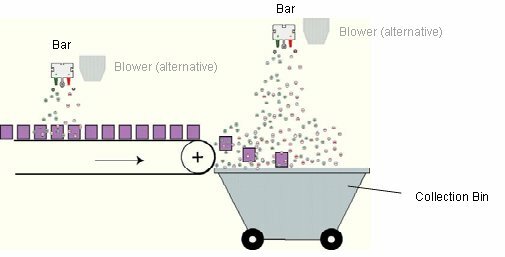 of a bar or blower depends on whether an airflow is acceptable or not. expensive air vacuum systems to hold the label in place. 1. Passed over a static charging bar and placed into the tool. 2. Moved into the tool and “pinned” directly to the surface of the tool. 2. Charged swarf contaminating the machine and environment. 3. Statically attracted dust being carried to other parts of the process. Carefully positioned ionising air curtains can both release and neutralise swarf and also neutralise the profile, assuring a clean and static free section at the end of the extrusion line. The movement of material through ducting can result in static charges being generated due to friction between the material being conveyed, and also between the material and ducting walls. This can result in bridging and blockage of restricted openings. The installation of a Ionising Flow Tube just prior to the area where blockages occur will neutralise the static charge and allow the material to flow freely through the ductwork. Entrapment of particles in paint finishes or laminates can lead to expensive rejection rates. For very small items, compressed air driven cleaning systems can be economic and effective. For larger items this is often no longer the case. The JetStream system provides an effective and economic solution for the removal of contaminants from product surfaces without the use of costly compressed air. This is achieved by directing filtered, dry, high velocity, ionised air to the contaminated surfaces via an external blower.